For those of you who celebrate Easter, there are probably many of you who have been slaving away preparing the food for Easter Dinner tomorrow or getting the kids’ baskets ready. 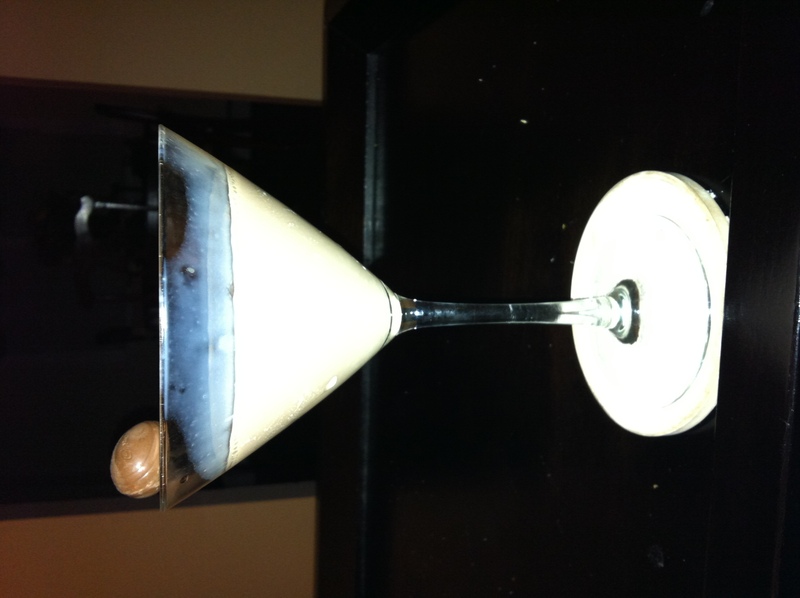 So today’s post is a yummy adult beverage for you to indulge in. Put the kids to bed, kick off your shoes, put your feet up and sip on this creamy martini as a reward for all of your hard work. For those of you who are like me and did not have to do any Easter preparations…well who needs an excuse to have a martini! I love Cadbury Eggs and so when I saw this recipe on Pinterest, I knew I had to try it. Of course, it called for too many bad (but oh so good…”cream” for instance) ingredients, so I decided to make it a “Slimmed Down Sensation.” And you can trust me when I tell you…this is sensational!! Now, because I didn’t have the liquor listed in the original recipe (Bailey’s Caramel & Crème De Cacao) I decided to improvise with what I had. If you’re making this for others or you don’t care about calories, you can always use regular caramel syrup, regular chocolate syrup and light cream (some people just aren’t a fan of sugar-free and low fat ingredients…go figure!). The Weight Watchers Points Plus value for this cocktail is only 6 points! No matter, it definitely tastes like all those delicious chocolate goodies that the Easter Bunny likes to drop in our baskets! I may have to rename this for next year, but I am just drawing a blank right now. Those of you who try it I’d love to know your suggestions or modifications to make it actually taste like the Cadbury Creme Eggs. One last thought…if you try this and think it has too strong of a caramel flavor you can decrease the caramel syrup to only 1 tbsp. and increase the half & half to 3 tbsp. I tried this as well in an effort to make it taste more like a Cadbury Egg and both tasted good, but I preferred the one with more caramel flavor. I never thought I’d get to a point in my life where I’m enjoying Easter Martini’s instead of chocolate bunnies…but hey, I guess you need to grow up sometime! Put all ingredients into a shaker. Shake until well combined and pour into a martini glass. 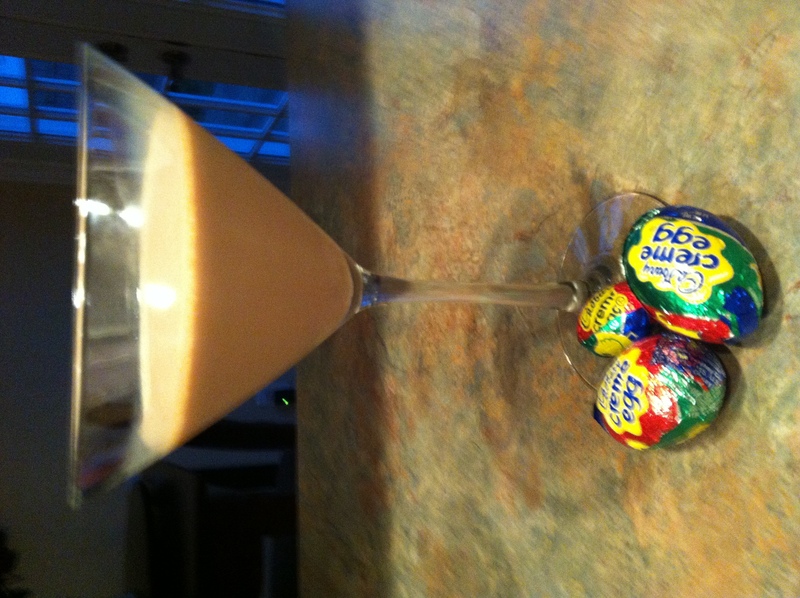 Garnish rim of glass with Mini Cadbury Egg and Chocolate Syrup, if desired. I saw the recipe you are talking about on Pinterest, and I had the same thought – not the same as the original Creme Egg! I made up my own and blogged about it the other day! Smash up a Cadbury Creme Egg, blend it with Pinnacle Chocolate Whipped, a splash of chocolate milk (I used soy milk) and ice. It was really good, and definitely tasted like the real thing! Ooooh, I will definitely have to try that! Sounds yummy! Thanks! Yum! I love Cadbury Creme Eggs… the problem with them is that they disappear so fast. Maybe the cocktail will take a little longer to savor? I’m thinking it goes even faster since there’s no chewing required! Lol!